Audiophiles often seem more obsessed with hardware and software employed to listen to the recordings than with the music itself. But, with the advent of affordable high-quality components, especially USB-powered DACs with integrated headphone amps, it is possible to enjoy an incredibly musical experience for only a few hundred dollars, something that would have been impossible a few years ago. Last year we wrote about he HRT MicroStreamer, and knew that other manufacturers would join the fray, so we weren’t surprised when Audioengine, who had already build an enviable reputation for its affordable desktop DACs, speakers, and accessories, introduced a small, USB flash drive-sized 24-bit DAC. During my conversations with Brady Bargenquast of Audioengine, one thread emerged. Their concern wasn’t looking at traces on an oscilloscope, or another piece of test gear. Their primary concern was the sound, not as a technical achievement, but as a sound that felt right. This argument is a bit hard to pin down, but I understood his thoughts immediately. One can hear terrible-sounding gear with all the right metrics, but metrics are almost always biased to meet the expectations of the test designers. So, we have all experienced lousy sounding gear whose specs on paper are superb. Likewise, some of my favorite sounding gear didn’t have superlative specs, so Brady’s point was well taken: it’s the sound and the pleasure it brings us that matters, not the metrics or measurements. The D3 is a small, rectangular block, about the size of an average USB memory stick. It features a metal injection molded (MIM) aluminum case, silver in color. It works without a hitch with either Mac or PC systems, without the need to install any drivers. It’s truly plug-and-play, and will respond to your computer’s volume control, although in our tests we used the more precise controls of the player software. It also has asynchronous USB data transfer with dual master clocks, so no need to set your sampling rate in your software. The DAC’s heavy lifting is done by an AKM4396 chipset, and the headphone amp is the well-regarded Texas Instruments’ LME49726, so from hardware point of view, the D3 covers all the bases. The input bit depth is 24 bit, and the native sample rate is 32kHz-96kHz. Higher sampling rates such as 188.2kHz, 192kHz are re-sampled to 96kHz for playback. We tested the Cambridge Audio DAC Magic XS, and even though it sports a higher native sampling rate, in our tests we couldn’t ascertain any difference that could be ascribed to a higher native rate. Accordingly, the D3 seemed at home with just about any source material we tossed at it. According to Audioengine, the “Texas Instruments LME49726 amp is able to provide low-impedance, high-fidelity audio and a 2-volt output which easily drives a wide range of headphones, including headphones with impedances as low as 12 ohms.” For users who wish to use their home stereo system, or powered speakers, the D3 has a relay-controlled stereo output to easily connect to any analog system. We did test a wide-range of headphones with the D3, including the superb Oppo PM-1 and PM-2 Planar Magnetic Headphones, Audio-Technica, Sennheiser, and Etymotic, Ultimate Ears, and Shure earphones. The D3 drove them all just fine, and only when pushing less sensitive models really hard did any graininess appear in the audio. Compared to the original Dragonfly, the D3 marked a significant improvement in the sound signature, with more warmth, ability to drive a wider range of transducers, and a less sterile sound. It ships with a ¼-inch adapter cable, and a small silver felt carrying case. I was also able to review a wide variety of titles using the D3. Using Decibel, Pure Music, and Amarra 2 & 3 as music players on my Mac systems, the new D3 proved an excellent product and comes highly recommended especially at its price of under $200. It reinforced the audio enhancements to Moondance, Astral Weeks, and His Band And Street Choir in this set of HD Tracks releases, along with the bass lines of Blind Faith and Steve Winwood’s vocals on Traffic: John Barleycorn Must Die, both high-resolution releases from HD Tracks. When you spend time listening to gear, my comments about not trusting metrics due to bias is something everyone should keep in mind. As soon as we plug in a piece of gear, place some headphones on, or download what is promised to be a higher quality version of an old favorite piece of music, that old friend bias kicks in. During a recent trip to Bulgaria, I spent a late night talking photography, music, and audio with Gintaras Cesonis who, when not serving as director of the Kaunas Photography gallery in Lithuania, is an avid music lover. Along with John Demos of Aurion, a high-end audio dealer in Athens, Greece, we compared and contrasted the D3 using the newly released Oppo PM-2 Planar Magnetic Headphones. Gintaras had never really heard high-resolution files, nor had he heard a headphone in the class of the Oppo PM-2, but what really surprised us was his clear preference for the D3 over the built-in audio of my 17-inch MacBook Pro. He kept switching between the D3 and MacBook Pro, and finally said that he was amazed at the D3’s audio improvement and wondered where he could find one in Lithuania, and took to calling it the “magic stick,” which seemed apropos. That served as an affirmation of the improvement served up by the D3 and cemented my belief in just how good a piece of engineering it represents. I liked the use of tiny little LEDs to indicate sampling rate, always reassuring, and the elegance of its design, which worked well no matter where I used it, and whatever genre of music I listened to. Will it take the place of a dedicated Class A headphone amp? No, but good luck trying to lug a Class A amp onto a plane, or to your office! Contrasting the D3 to the Cambridge Audio DAC MagicXS, the HRT MicroStreamer, and the DragonFly (none of which are slouches and all of which are first-rate units), the D3 was warmer, and musical to our ears, non-fatiguing, and consistently enjoyable. As I completed this review, the long-awaited remastered versions of Led Zeppelin IV and Houses of the Holy were released, and HD Tracks were kind enough to shoot me out the high-resolution versions to review. As one might expect the new versions are cleaner, with less distance between the instruments and Robert Plant’s voice than earlier remastering efforts. However, with the native soundboard in my MacPro or MacBook Pro, (I compared a lossless rip of the last remastering version) the difference between older versions and the newer ones were subtle, but the opening of Stairway to Heaven, the reverb on the intro guitar is an area in which you can hear the difference, provided you have a good DAC. The D3 impressed upon every listen. What a step up it represented! Switching from it to the native soundcards in the MacPro and MacBook Pro, was clearly discernable. Over the past several years we have tested a variety of USB-powered DAC/Headphone amplifier combinations, and most were improvements on our computers’ base audio. 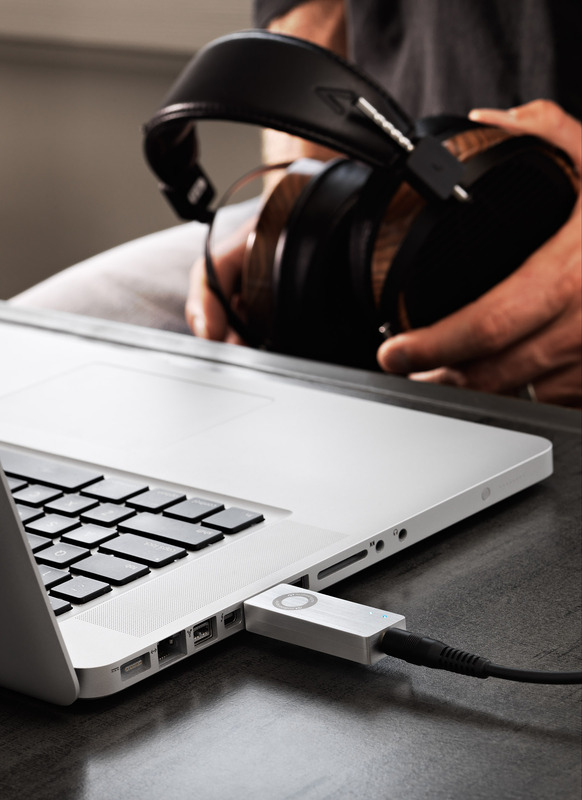 But, the D3 offers a warmth, well-rounded airiness and soundstage, and precision attack that made it our new reference unit among USB powered DACs. When packing some headphones or earphones for a recent weekend trip, it quickly became the go-to unit to insure great sound on the go. Audioengine is batting .400 with the D3 24-bit DAC/Headphone amp. Highly recommended!